yes, it came to me with a roll of film inside! Sadly, I was unable to rescue any images from it. I have no idea why, but I really wanted this old Falcon camera to work well. Sadly, I would end up being frustrated. Made by the Utility Manufacturing Company in 1937 or so (there’s not a whole lot of information on the company or the camera), it appears to be a fairly sophisticated camera for its time, with a number of innovative features. The camera is made from Neilite, an early plastic predating Bakelite. The back is made of heavy cast metal, with metal viewfinder, knobs, lens/shutter assembly, and the little “foot” that folds out (see above) to keep it from tipping forward when it sits on your shelf. The shutter/lens assembly is on a helical mount that can be extended when you push the little chrome button to the right (left in photo above). When retracted, the word “Falcon” is at the top, and as you extend it from infinity to four feet, the ring with the name of the camera and the company rotates until “Falcon” ends up at seven o’clock at its farthest, clicking into place at each of the focus distances. It’s got a Deltax shutter that can be set for time, bulb, 1/25, 1/50 and 1/100s, with apertures on the two-inch Velostigmat lens that open from f/3.5 to f/22. 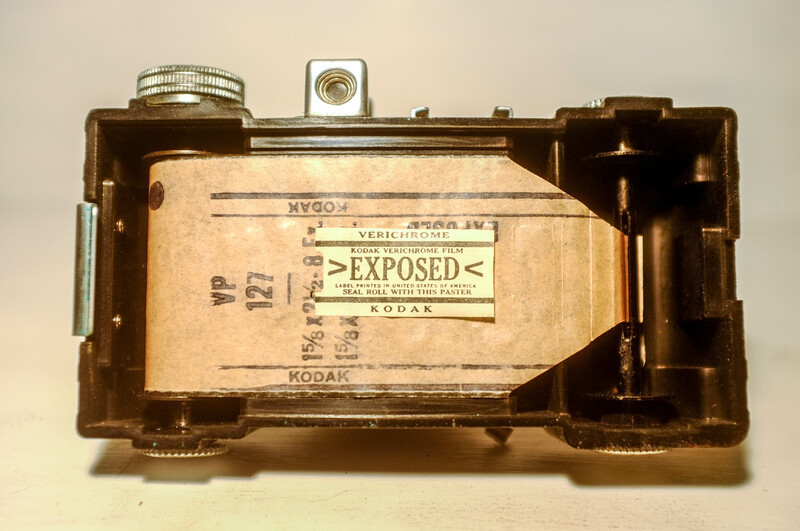 Unlike many cameras that were made well after 1937, the shutter is self-cocking. As you’ll note from the photos I snapped, there is no double exposure prevention mechanism. The Falcon takes 3×4 cm photos on 127 film, yielding 16 shots per roll. It’s the first 127 camera I’ve used that didn’t take twelve square photos, and I’ve never come across the system used in the Falcon to control film advance. You slide the A/B button down, revealing two red windows, and advance the film so the “1” appears in the “A” window, shoot, advance it so the “1” appears in the “B” window, and shoot – and so on. Given that there’s no double exposure prevention, it’s a bit tricky to keep track of where you are on the roll. Given the shutter and aperture options, it’s best to use 100 or 50 speed film on the Falcon, rather than the 400 I normally use – on a sunny day, you’d either need a 1/200s shutter speed or an f/32 aperture to make it work. It’s a fun little camera to shoot – like all vintage cameras, it’ll get you some curious looks. With the lens/shutter retracted, it fits nicely in a pocket. The viewfinder is a bit small and tricky to see through, but once you get the hang of it and have your settings right, I find it’s best to operate the shutter with your middle finger. As I hinted earlier, however, in terms of photo quality, I was disappointed. With a relatively sophisticated lens and shutter (for 1937!) and no evidence of dust or fungus, I was hoping to get better results than I did. The first roll I shot had a number of out-of-focus exposures, which is to be expected from time to time when you’re guessing distance. But I didn’t expect the overall haziness, and for some reason in about half the shots, the backing paper markings somehow came through! My best guess is that the Efke 100 film was a bit old – it came with us from India to Washington and back to Madagascar, and though it was in the freezer when it was with me, I think it may have degraded while it was not. For the second roll, things went a bit better. I believe this would have been a roll of Arista 100 that I cut down to 127 size. Still, I can’t explain the “speckling” effect on some of the photos – both in light areas and in dark. The other issue with the camera is the scratch marks from advancing the film. I checked the inside of the camera and didn’t find any rough edges, so am unsure how to remedy this – it may help to spool the film more loosely next time. Notice also the double exposure! Or was it triple? This entry was posted in Vintage cameras and tagged camera, Falcon, Model F, review, Utility Manufacturing, vintage. Bookmark the permalink.